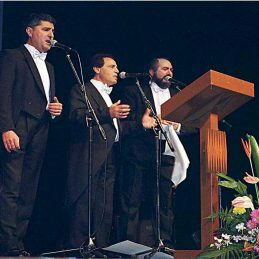 Not only do they look like the real Three Tenors – they can sing! And whats more, they can entertain! Beyond 30 years of experience. This is a Cabaret Show like no other. Three great voices singing the most noted songs of the century. From the ever popular operatic arias to English, Spanish and Italian Classics and also modern songs and ballads loved by all. The Three Tenors Tribute Show without doubt, performs the most Versatile, Sophisticated, Heart-felt Repertoire that any Show could possibly present in 2 hours. A truly great Show, performed in an environment of humor and dialogue by professional singers who enthrall and captivate their audience. Comments like the following have been received after every performance: “The best show I`ve seen in a long time”. “This show kept me on the edge of my seat”. “You`d think that they were the real ones”. “I`ve got to tell my friends about this Show”. “I saw the real Three Tenors in Rome and again in Melbourne and I can honestly say that I enjoyed this Show much more”. “I`d go and see this show again anytime”. The Three Tenors Tribute Show travel and perform all over Australia and New Zealand. Enquiries have been received from Las Vegas, Asia and Athens. If you would like to share in the magic of the Three Tenors Tribute Show and treat your audience to a night that they will never forget, There is no other show like The Three Tenors Tribute Show.